For other uses, see Saxony (disambiguation). Saxony-Anhalt (German: Sachsen-Anhalt, pronounced [ˌzaksən ˈanhalt]) is a landlocked state of Germany. Its capital is Magdeburg and it is surrounded by the German states of Lower Saxony, Brandenburg, Saxony, and Thuringia. Saxony-Anhalt covers an area of 20,447.7 square kilometres (7,894.9 sq mi). It has a population of 2.34 million (more than 2.8 million in 1990). Saxony-Anhalt should not be confused with Saxony or Lower Saxony, also German states. Saxony-Anhalt is one of 16 states of Germany. It is located in the western part of eastern Germany. By size, it is the 8th largest state in Germany, and by population, the 10th largest. In the north, Saxony-Anhalt is dominated by plain. In the sparsely populated Altmark, old Hanseatic cities like Salzwedel, Gardelegen, Stendal, or Tangermünde are located. The transition from the Altmark region to the Elbe-Börde-Heath region with its fertile, sparsely wooded Magdeburg Börde is accomplished by the Colbitz-Letzlingen Heath and the Drömling near Wolfsburg. In the Magdeburg Börde you can find the cities of Haldensleben, Oschersleben (Bode), Wanzleben, Schönebeck (Elbe), Aschersleben, and Magdeburg, from which the region derives its name. In the south-west, the Harz mountains are located, comprising the Harz National Park, the Harz foreland and the Mansfeld Land. The highest mountain in the vicinity is Brocken, with an elevation of 1,141 meters (3,735 ft), which at the same time is the highest elevation in northern Germany. In this area, one can find the cities of Halberstadt, Wernigerode, Thale, Eisleben, or Quedlinburg. Located at the River Saale and Unstrut in the south of the state, you find the winegrowing area Saale-Unstrut and the cities of Zeitz, Naumburg (Saale), Weißenfeld, and Freyburg (Unstrut). Neighboring Saxony, you can find the metropolitan area of Halle (Saale)/Merseburg/Bitterfeld-Wolfen (called Chemiedreieck - chemical triangle) which reaches to the Leipzig agglomeration. In former times, the chemical industry had its economical focus on this area around Leuna. Finally, in the east, Dessau-Roßlau is situated at the River Elbe (as is the capital Magdeburg) amidst the Anhalt-Wittenberg region. The capital of Saxony-Anhalt is Magdeburg. It is the largest city in the state, head-to-head with Halle. 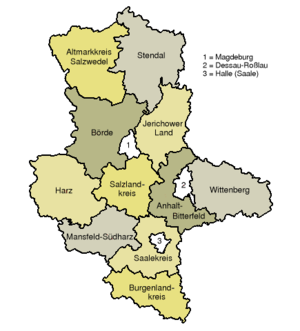 Saxony-Anhalt is subdivided into eleven rural districts and three urban districts. The current state was created by two districts reforms. By the first one in 1994, 37 districts were reformed into 21 new districts. The last reform took place on January 1st, 2004, when the 21 districts were reordered into now eleven districts. From 1994 to 2003, Saxony-Anhalt was divided into 21 rural districts ("Landkreise"). Above this level, there were three governmental districts (Regierungsbezirke): Dessau, Halle and Magdeburg. On 1 January 2004 these three governmental districts were abolished. Coat-of-arms of Saxony-Anhalt between 1946 and 1952. Saxony-Anhalt was formed as a province of Prussia in 1945, from the territories of the former Prussian Province of Saxony (except the Regierungsbezirk Erfurt), the Free State of Anhalt, the Free State of Brunswick (Calvörde and the eastern part of the former Blankenburg district) and the formerly Thuringian town Allstedt. See the respective articles for the history of the area before 1945. When Prussia was disbanded in 1947, the province became the state Saxony-Anhalt. It became part of the German Democratic Republic (East Germany) in 1949. From 1952 to 1990 Saxony-Anhalt was divided into the East German districts of Halle and Magdeburg. In 1990, in the course of German reunification, the districts were reintegrated as a state. Former Minister-president Wolfgang Böhmer (CDU) did not run for re-election. Saxony-Anhalt is famous for its good soil. The "Magdeburger Börde" contains the best soil in all of Germany and some of the best of Europe. It is often said by the local populace that the smoothness of the soil is more luxurious than balls of silk. The food industry has an important role in this state. Some of the best known products are "Baumkuchen" from Salzwedel (Altmark) or "Hallorenkugeln" from Halle. In the industrial sector the chemical industry is quite important. One of the biggest chemical producing areas can be found around the cities of Wolfen and Bitterfeld. Because of the chemical industry, Saxony-Anhalt is the largest receiver of foreign direct investments in all of eastern Germany. Saxony-Anhalt is also the location of numerous "wind farms" throughout the state producing wind-turbine energy. In 2010 80 % of citizens in Saxony-Anhalt were non-denominational and more were leaving the churches than entering them. In 2005 an estimated 14.2 % of all persons living in Saxony-Anhalt lived on the welfare lines, either receiving Arbeitslosengeld II or Sozialgeld. In 2006 36.1 % of all children younger than 15 lived on welfare (Sozialgeld). ^ "Bevölkerung der Gemeinden nach Landkreisen" (in German). Statistisches Landesamt Sachsen-Anhalt. 31 December 2010. http://www.statistik.sachsen-anhalt.de/download/stat_berichte/6A102_hj_2010_02.pdf. ^ "halleforum.de - Population: Magdeburg overtakes Halle". http://www.halleforum.de/go/28918. This page uses content from the English language Wikipedia. The original content was at Saxony-Anhalt. The list of authors can be seen in the page history. As with this Familypedia wiki, the content of Wikipedia is available under the Creative Commons License.